If you are new to First Covenant, we hope that you will find this a meaningful place of worship, but also that you will find significant ways to get involved in the work of building God's kingdom. Because of the diversity represented in our community, Sunday morning worship may look very different week to week and if you are checking us out for the first time, you may want to come three or four times and get to know what the variety of our worship like looks and feels like as well having an opportunity to meet and get to know some of the beautiful people that call this place home. Any given Sunday, you may be invited to join us in singing in one or all of these styles and music may be led by guitars and drums, accordions or organ, depending on who is leading music that day. We've found it to be an act of worship to learn the different forms and expressions valued by different people in our congregation. Occasionally, we hold a class we call First Covenant 101. 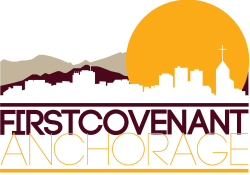 This class is meant to give an overview of who we are and where we come from, including a brief history of the Covenant Church as well as the Covenant's involvement in Alaska. But mainly, it is an introduction to First Covenant Church - who we are, what we believe and why we choose to live out God's mission the way that we do. This class is required prior to being considered for membership. If you are interested in learning more about the church or how to become a member, please fill out the form to the right and Pastor Criss will be notified of your interest and can let you know when the next class will be held. I am interested in learning about the next FCC 101 class I am interested in learning more about what membership means.